Right wing Israeli prime minister Benjamin Netanyahu had come to London to meet Gordon Brown on Tuesday, 25 August. 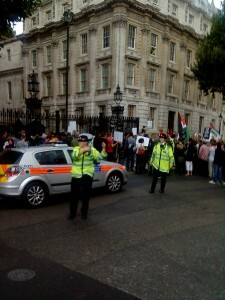 Stop the War Coalliation and Palestine Solidarity Campaign had called an emergency protest at Downing Street. For 12 hours notice, it was not a bad turn out at all. Netanyahu is part of a government that believes it has the right to build settlements on the occupied West Bank. Palestinians are being evicted from their homes. Food and medical supplies are denied. Although after this meeting Brown claimed he was confident that further settlement building will halt, we all know this is not true. Netanyahu himself has said that people who are in these settlements already need to “expand”, what does that mean? More innocent people being forced out of their homes. We all know the only way to end this is to pull out of the settlements all together, the Israeli government provided incentive for settlers to come into Palestine, they should now offer incentives for settlers to go back into Israel and give back the Palestinians what is rightfully theirs. Netanyahu is the architect of the suffering experienced by the Palestinian people and the Arab residents of Israel. Do not forget that for a moment. This right wing prime minister will bring no good. Do you really think that he can go back to Israel and convince his right wing government that all settlements must stop? No chance.